Chiang Mai University Language Institute’s TEFL Certificate Program, recently held its English summer camp activities called “ Live Your Dreams” to help develop language skills for Chiang Mai schools’ students. Duty Governor of Chiang Mai, Chumporn Saengmanee (centre), and Chairman of the Child and Youth Council of Chiang Mai, Karuna Thipboonrat, pose for a group photo with council members at the Three King Monument in Chiang Mai on May 3 to mark the launching of the newly established council. 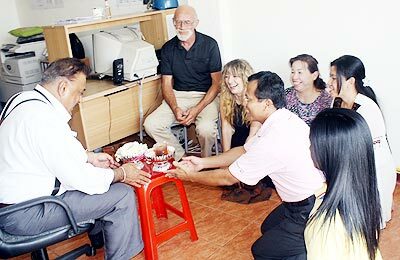 The Chiang Mai Mail staff led by Editor Phitsanu Thepthong pay respects to the publication’s Managing Director, Pratheep Malhotra (seated left), during the traditional Thai New year celebrations. 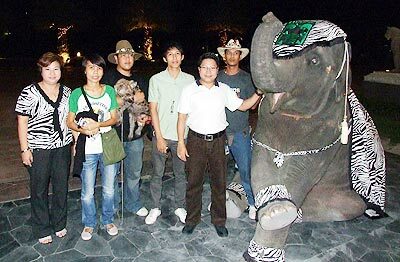 The Veranda Resort and Spa in Chiang Mai hosted a special event on May 2 and held by the Tourism Authority of Thailand (TAT) to introduce new tourism related products and services to representatives of the travel and tourism industry. 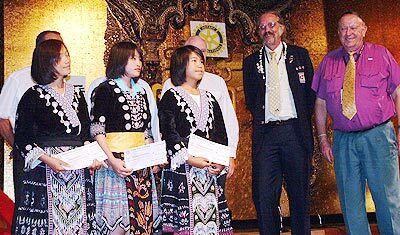 Arada Thaotrakul, 18, Nipawan Thaotrakul, 19, and Yuwadee Saikanokthara, 19, three hill tribe students from Ban Huaypuengmai School in Mae Hong Son’s Mae Sarieng district, each receive scholarships worth 20,000 baht from representatives of the Rotary Club Eastern Seaboard in Pattaya. 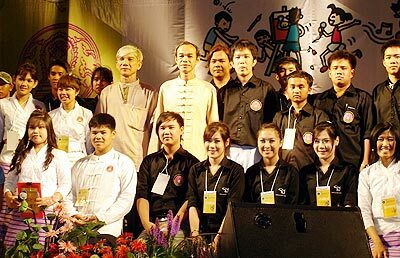 The presentation ceremony was held during the Lanna Rotary Night at Khum Khantok in Chiang Mai, April 18. 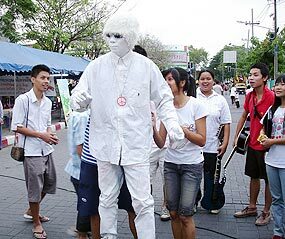 A human robot displays his automaton talents on Chiang Mai’s Phrapoklao Road walking street, Sunday, May 3.